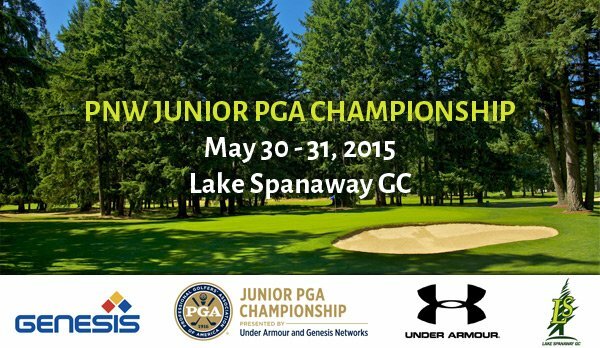 The Pacific Northwest PGA Junior Championship took place this weekend (May 30-31) at Lake Spanaway GC. There are were over 100 juniors playing in the three age division (16-18, 13-15 and 12 & Under). 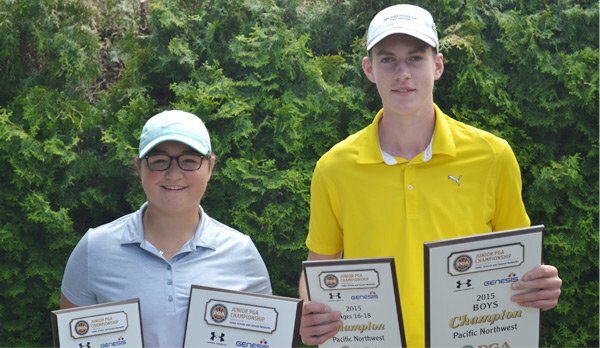 Spencer Tibbits of Vancouver, WA and Ellen Secor of Portland, OR won the 2015 Pacific Northwest Junior PGA Championship presented by Under Armour and Genesis Networks at Lake Spanaway GC in Tacoma, WA. By winning the boys’ and girls’ divisions respectively, Tibbits and Secor qualified for the 40th Junior PGA Championship presented by Under Armour and Genesis Networks, Aug. 3-6, at Miramont Country Club in Bryan/College Station, Texas. Tibbits, 16 posted a final-round 66 for a two-day total of 133 and a 7-stroke victory over Sam Warkentin of Bainbridge Island, WA. Secor, 17 had a final-round 71 for a two-day total of 149 and a one stroke victory over Olivia Benzin of Tacoma, WA. Tibbits and Secor will join approximately 150 of the nation’s top junior golfers in the PGA of America’s flagship junior event, the 40th Junior PGA Championship presented by Under Armour and Genesis Networks, Aug. 3-6, at Miramont Country Club in Bryan/College Station, Texas. Winning the girls 13-15 age division was Alyssa Nguyen of Renton, WA. She won by 5-strokes over Janine Surge of Seattle, WA. In the boys 13-15 age division, Samuel Pyon of Happy Valley, OR won by two strokes over Victor Wang of Sammamish, WA. Winning the girls 12 & under age division was Montgomery Ferreira of University Place, WA. She won by a remarkable 14 strokes over Laurnn Nguyen of Seattle, WA. Scotty Kennon of Bandon, OR won the boys 12 & under age division by four strokes over Stephen Dai of Bellevue, WA.